AUGUSTA -- It hangs prominently: a dark blue star contrasting sharply against the white backdrop. It's a notice that one of their own is missing; it's reserved for family. AUGUSTA — It hangs prominently: a dark blue star contrasting sharply against the white backdrop. It’s a notice that one of their own is missing; it’s reserved for family. That makes this star right at home outside the Augusta Police Department. 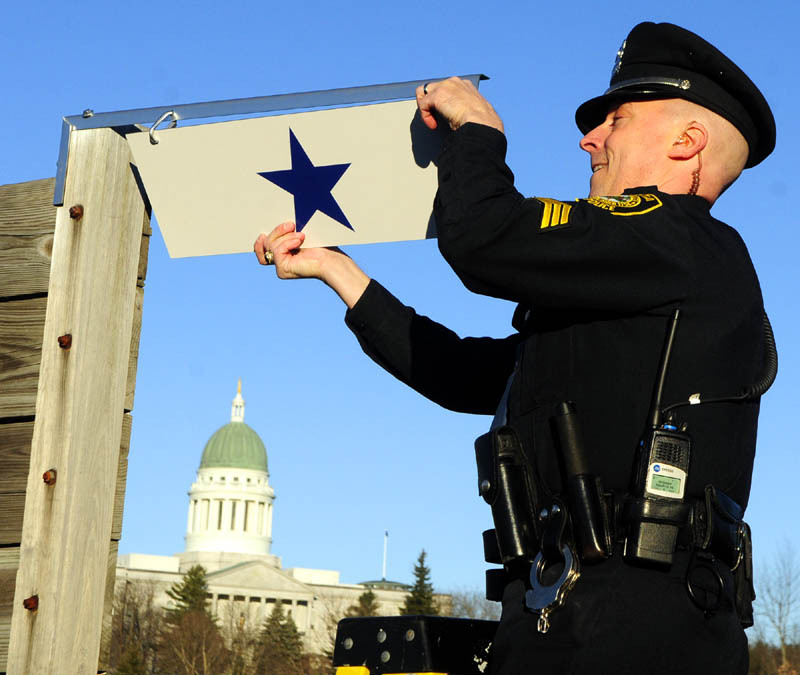 The brief ceremony, which included members of Dos Santos’ family and the Maine Army National Guard, including Chief of Staff Col. John Jansen, marks the first time that Augusta police have hung a star for a deployed officer. 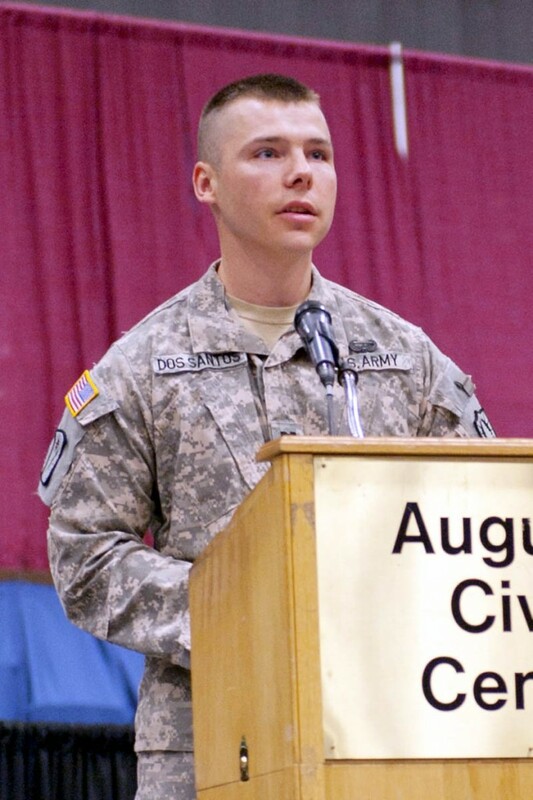 Dos Santos, 31, who joined the department in 2006, is a captain with the Maine National Guard and commander of the 488th Military Police Company. His yearlong deployment began in July, and he arrived in Afghanistan a couple months later. Families have hung blue stars in their windows since World War I to signify a member is fighting overseas. Dos Santos’ father, Norman Nadeau, said his family has hung a blue star during both of his son’s deployments. Nadeau is glad Augusta police have followed suit. Dos Santos’ fiancee, Destinee Ryder, said she hears from Dos Santos almost every day, mainly online through Skype. Being able to see Dos Santos has made his absence easier to bear, perhaps especially for his young children. Augusta police Chief Robert Gregoire said hanging the star was “a no-brainer” when Behr proposed it recently. Dos Santos is one of two active-duty guardsmen or reservists to serve with the Augusta Police Department — Officer Brad Chase is a sergeant with the Air Force Reserve — and one of countless others who have worked for both the city and the military. Behr said in recent years he, Dos Santos and Chase were deployed simultaneously. “At one time there would have been three stars hanging,” he said. Gregoire described Dos Santos as a mature leader who is a role model to the other officers. The yearlong absence of such an employee poses a challenge both professionally and financially, Gregoire said. Augusta, which does not hire reserve officers, makes do with extended shifts and overtime. Dos Santos’ coworkers fill in the gaps while he is gone. That service is, at least in part, made possible by Augusta police willingness to do extra, said Rolanda Nadeau, Dos Santos’ mother. “I know Eric appreciates everything the guys do,” she said. Gregoire is quick to point out that his department benefits from the training and experience Dos Santos and other service members gain while deployed. “It’s invaluable to us,” he said. Those benefits are not limited to law enforcement. Battalion Chief Steve Leach of the Augusta Fire Department said one of his department members, Jim Worcester, has served two tours in a field hospital with the Maine Army National Guard. Worcester has been exposed to a higher frequency of trauma patients — and learned how to treat them — than he would ever see at home, Leach said. Leach, whose department hangs blue ribbons for deployed soldiers, said his department offers overtime to ensure minimum staffing on shifts when Worcester typically would work; but as with Dos Santos, the bigger void may be his experience. “We certainly miss having him around, but we’re able to continue with our mission while he’s out serving the country,” Leach said. Kennebec County Sheriff Randall Liberty said his department started hanging blue stars when he and Deputy Christopher Cowan deployed to Iraq in 2004. The office, including corrections officials, has seven people deployed and another three who have deployments pending. The office fills the vacancies with part-time officers and overtime. For one deployed officer, Deputy Matthew Cain, the county filled the slot with another full-time deputy for the entire four years he will serve on active duty. That commitment is not taken for granted by the service members or the branches in which they serve, said Maj. Michael Steinbuchel, public affairs officer for the Maine Army National Guard.